A Visit From Santa is a 500 piece jigsaw puzzle designed by artist Cindy Mangutz. Santa has just touched down on the roof with his reindeer, and is ready to climb down the chimney to deliver his presents on Christmas eve. Available in two piece counts. Christmas At Grandma's And Grandpa's is a 500 piece jigsaw puzzle designed by artist Cindy Mangutz. Grandparents are enjoying the holidays with their grandkids in their home by the lake. Kids can be seen through the window making snowmen and playing in the snow. Available in two piece counts. Christmas Treats is a 500 piece jigsaw puzzle designed by artist Cindy Mangutz. A cat is being tempted by a tray of just baked sugar cookies on the kitchen counter. Through the open window we see kids singing songs and taking a sleigh ride outside in the snow. Available in two piece counts. 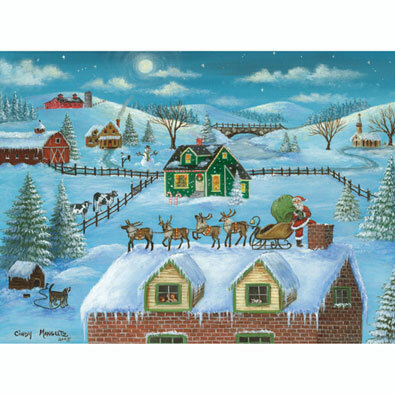 Christmas Morning is a 500 piece jigsaw puzzle designed by artist Cindy Mangutz. Newly opened toys are scattered about the base ofa decorated Christmas tree next to a crackling fire in the fireplace. Children can be seen though the window skating, skiing and sledding on Christmas morning. Available in two piece counts. Christmas Village is a 500 piece jigsaw puzzle designed by artist Cindy Mangutz. The village is lively with holiday activities. Last minute shoppers, strollers, carolers and children playing in the snow surround this charming scene. Available in two piece counts. Memories Of Christmas is a 500 piece jigsaw puzzle designed by artist Cindy Mangutz. Holiday festivities are in full swing in this town by the sea. A child waves from the lighthouse to the schooner passing by with a Merry Christmas banner flying in the wind. Available in two piece counts.